Prescription sunglass lens service available. Julbo GLACIER GLASSES -130 years of tradition have made Julbo the #1 eyewear choice for climbers and mountaineers. Each model features 100% UVA, UVB & UBC protection, replaceable parts, hard plastic case, retaining cord and cleaning cloth. Prescription lenses available via 3rd party mail order for additional fee - information provided with your purchase. Remember snow reflects 85% of Ultra Violet light and as you gain altitude the intensity of the sun increases 10% for every 1000 M (3314 ft). 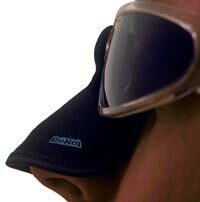 Stay covered up (consider a Nose Guard), use adequate sun block on your exposed skin and don't forget your Julbos!